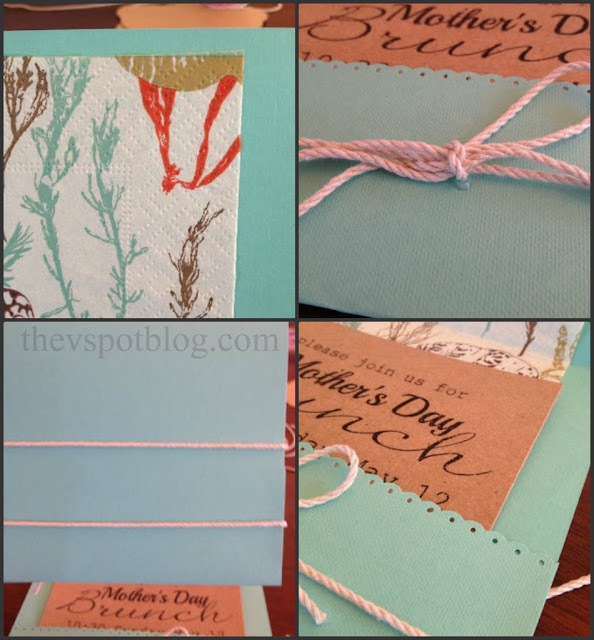 I sent out the invitations to our annual Mother’s Day Brunch over the weekend. They were super simple to make, and I used paper napkins to make them. 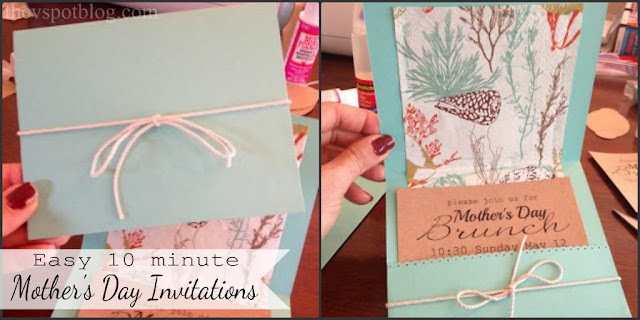 These easy DIY invitations took less than 10 minutes to make. Please excuse the iPhone photos. This was such a quick and easy project that I didn’t even bother to get out the “big” camera! I usually don’t know the theme or color scheme for our annual Mother’s Day Brunch until I make the invitations. A few weeks ago when I was shopping at Roger’s Gardens with a friend, we spied these beachy paper napkins. I have other craft ideas for them, but in the meantime, they were the jumping off point for my brunch. You can treat them just like regular paper. I used my paper cutter to trim them to the size I wanted, and then simply pulled off the printed top ply of the napkin and glued it to the card stock base. Everything else is a matter of folding and gluing. Easy. You can click here to get measurements and see how these were constructed. They are exactly the same as the ones I made for our Halloween party. 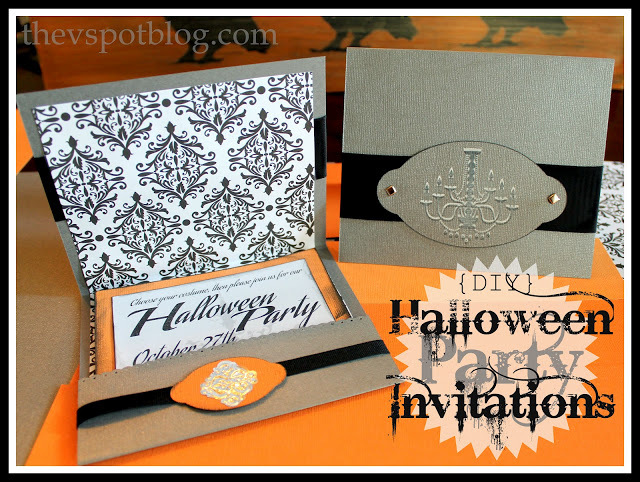 The only difference is that I simply tied twine around the invitations instead of doing ribbons and embellishments. Beautiful! Those are the colors for both M's graduation party and her new bedroom at college! Love, love, love me some coral and blue! LOVE this idea Viv. I have just as much of a paper napkin addiction as I do a scrapbook paper addiction so…..
Wow, these are so cute. Paper napkins can be so pretty. I had a friend in the UK who collected them! That sea design you chose is so fresh and sweet and summery.